The Kimberley ETV is one of four 2nd generation Earth Treasure Vases that were given to Jeremy Ball and the Australian ETV Mob after the burial of the last of the original ETVs on the ancestral lands of Aunty Margaret Katherine in Jawyon Country, Northern Territory, Australia, in 2013. Magi and Eva participated in that pilgrimage, then traveled with us again when Aunty Margaret dedicated four next gen ETVs for the four directions of that continent, and again when the first of these was taken, at Margaret’s request, to Gabarnmung, the 50,000 year-old rock shelter in Arnhem Land that she and her people are custodians of – an astounding sacred site we are so grateful is now part of the ETV mandala. “Each full moon there has been a group gathering here to give and receive blessings to both this Vase and the many Vases buried around and within the Earth. These many Vases form a great Mandala of Light holding alliance with all beings that serves to heal, protect and serve Mother Earth. We have come to deeply respect this Vase Being and over time have sought to listen to her deeply….and when we didn’t she certainly became ‘louder’ and more insistent! No doubt the greater workings that have been initiated are held esoterically, beyond what we are able to understand at this point, but will surely open in their truth when the Vase is buried deeply in the womb of the Mother at Purnululu. I remember Cynthia Jurs repeating the words of the great Lamas who gave her the many Vases – ”Just put them in the ground. They know what to do”. “What I so honor about the Earth Treasure Vase practice is the completeness of the circle that it holds. On the one hand it reaches into such deep profound esoteric ways and truths that are far beyond our human understanding at this point in our evolution – “they know what to do”. 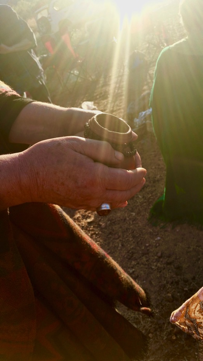 On the other hand, the Vase can be approached by anyone, anywhere, with the softest prayer of their heart. It is my belief that every one of us on this planet holds a dream of a better life, a better world, a yearning that can be offered in the simplest way and be received by the Vases. In this way we can all participate in service to the greater good of all and of Mother Earth. “As we quicken into our journey, among the many wonders, blessings and directives of this Vase there is the emergence of the call of “Ancientness” sounding the note for this particular pilgrimage. Twelve of us ‘balandas’ (white people) will journey with some of Aunty Margaret’s (indigenous) mob, travelling through the outback, to join with another indigenous mob at Warmun. The Warmun community are the custodians of the land upon which this Vase will be buried. 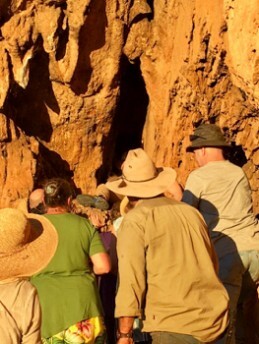 We will then all pilgrimage into Purnululu and, led by the elders, find the place to bury this beautiful sacred vessel. 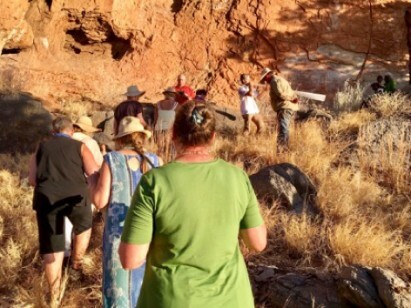 Please join me this full moon with host, David Nicol of the Gaiafield Council and Australian ETV stewards, Magi and Eva, in meditation and ceremony for the accomplishment of the Bungle Bungles Purnululu ETV. May the Seven Sisters Dreaming bless the path ahead for the benefit of all! We were a group of thirteen white fellas and members of the Jawoyn community around Katherine NT Australia, who journeyed across this vast land to meet eight indigenous fellas (including kids) and Drover the dog in Kununurra in the Kimberley in northeast Western Australia. Here we were welcomed to Country by the elders of that land. It was touching to witness them holding the Earth Treasure Vase and talking ‘language’ into it and it was heart rending to witness the pain they carry as do so many of the world’s indigenous peoples. But women’s law was about to return to their land after nine years of absence. 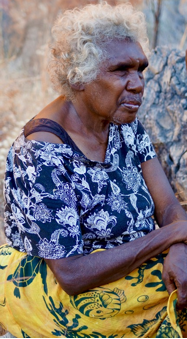 This country and the lands of Purnululu, that was our destination, are governed by Grandmother’s Law – the highest law. This was a journey led by the Feminine, the Mothers, the Grandmothers, and the Great Grandmothers. The men, full heartedly and with deep knowing and respect, supported and held the circle, enabling all that came forth. It was a profound, remarkable, and honored journey and the response of the peoples, the land, the creatures of nature, the heavens and the Earth was overwhelming. We were led and joined and the journey celebrated the placement of this Vase into the womb cave of the Mother Earth. It was an epic and complete journey. The completeness included meeting and working with the pain and grief held in the land by the aboriginal peoples. Our group was strong, open hearted and able, and with the blessings of the Vase in front of us there was much transformative work done in this regard. We gathered Ironwood leaves, smoked them in the cooking pot and walked and sang the broken Songlines until they were alive again. 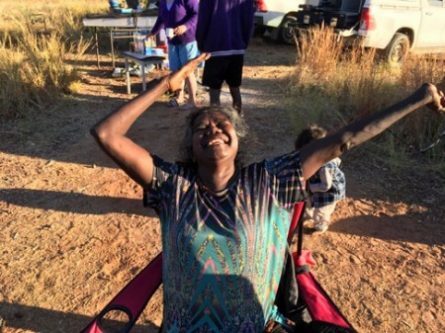 There was deep healing given to Aunty Margaret (who, as some may know, almost died earlier this year) which allowed her to journey with us all the way into Purnululu bringing her central blessing to our pilgrimage with her joy and strong spirit. 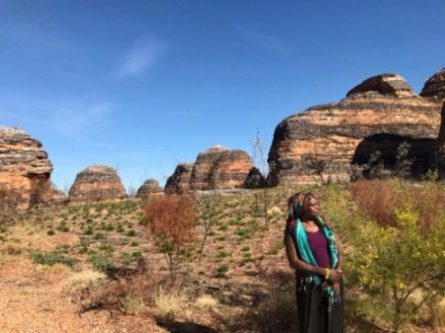 The journey was a weaving in time and a weaving of right relations, of honoring and respect, especially with the elders of Purnululu whom we did not know before beginning our journey. After leaving Kununurru in 4WD vehicles, we travelled south to Turkey Creek-Warmun the closest township to Purnululu. 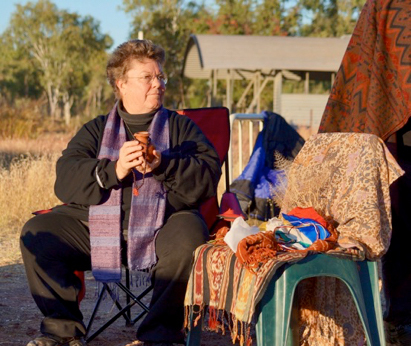 Here we began the ‘conversation’ and waited to know if the custodial elders of Purnululu would welcome us to Country and give us permission to enter and place the Vase within their sacred land. There was much waiting while the mob was off Barramundi hunting. 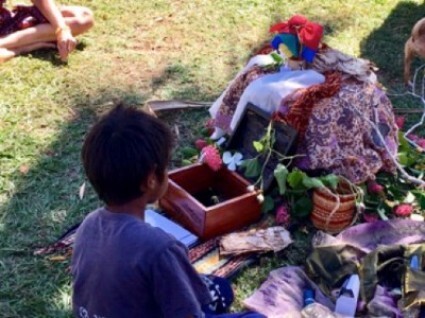 I had been given a pearl Wandjina for the journey and while waiting, I understood that the Wandjina, who are the Creator Beings of the Kimberley, were sending energies of great strength and I knew we had permission and direction from the Wandjina Creator Beings. It was an affirmative and formative moment for the Work. Then YES! 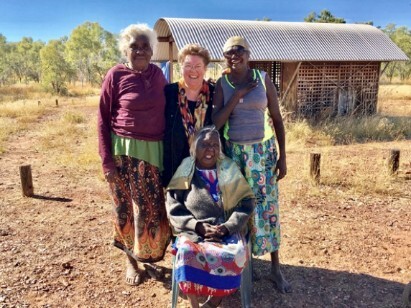 Gitja elders of Boonoolooloo/Purnululu, Aunty Shirley Drill and Aunty Bessy Daylight agreed, in exchange for tobacco and pies, to take us into Country. 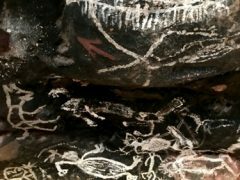 So we were welcomed with smoking and water ceremonies and next day, we entered the ancient lands of Purnululu surrounded by its sandstone formations dating back 360 million years. We went to an encampment belonging to the indigenous community, into the heart of their sacred grounds. It was beautiful land, dotted with spinifex, hallowed in golden light and grassed fields framed by the rising cliff escarpments. Their camp had the remnants of shelter buildings and an array of metal beds from days past. This was home. With Aunty Shirley and Aunty Bessy came Claire and her toddler son known as ‘grandpa’ (Brendan) – Aunty Shirley’s granddaughter and great grandson. Then came more weaving together and more waiting. Waiting for Country and the elders to meet the truth and purpose of who we were and if and where the Vase would be placed. And gracefully the revealing came. In the afternoon of that day Aunty Shirley said to Jeremy “Come on boy, take us fish’n”. Off four of them went, no roads, just moving through the scrub to the river. Jeremy, in his wisdom, made no mention of the Vase. Aunty Shirley clamored down rocks, threw a piece of twine in her hand into the river and…a fish, then another, and another! Back she came and said to Jeremy, “Ok boy, now lets go and find the place for this Vase”. And this is how it was done. We gently but powerfully began to experience ourselves as family, as part of Country, as deeply belonging. We were a ‘mob’. During the first night I was enlivened and aware, for an extended period of time, of a very large Spirit kangaroo standing upright beside me. He was very grand, proud, serene and present. Next morning Aunty Shirley said that the Country we were on was “Kangaroo Dreaming”. We had welcome and permission. When we first entered this sacred land two brolgas were at the entrance and in the golden light of late afternoon we found the placement site within the great rock escarpment. The site was easily ‘shown’ to us and the brolga birds taking flight confirmed our agreed knowing. 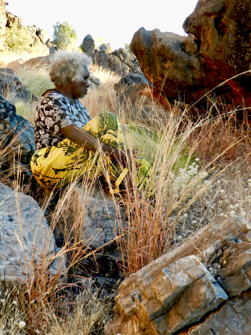 Aunty Shirley led us further on through the scrubland to a cave with stunning rock art. We felt honored to be trusted enough to know this place. That evening back at camp we had the final blessing ceremony for the Vase. 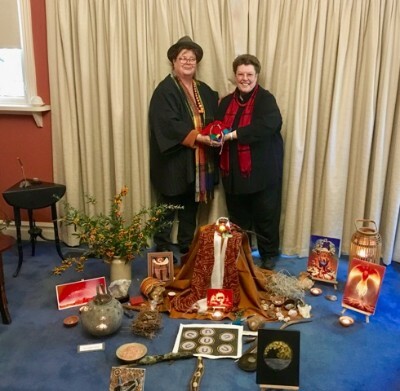 The prayers and offerings drawn from our souls filled hearts and from the palpable presence of the greater world community, touched deeply into both the Vase and our own beings. The next morning on the solstice dawn of 21st June 2017, around the campfire, we ritually sealed the Vase. 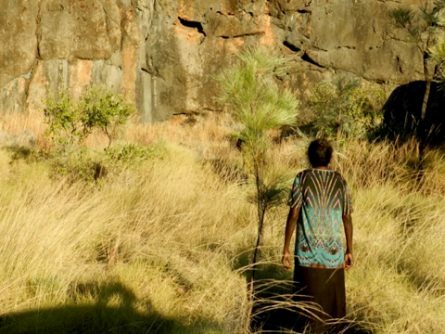 Led by the sound of the didgeridoo played by Julian, we walked the Vase up to the cliff-face where the elders were waiting. Aunty Shirley received the Vase and offered her last prayerful blessing and sealed the box. 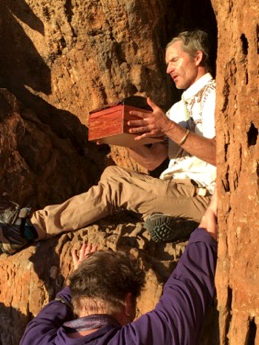 We prayerfully offered the Vase to the Mother as Julian received the Vase and slithered into the rock opening in the cliff face. With the placing and burying of the Vase into the Earth cave the Vase was immediately and powerfully drawn into the inner realms. We passed in rocks that were placed on top of the buried Vase but in Julian’s words “The Vase was no longer there. There was nothing left under those rocks”. Jeremy too shared that whilst holding to the rock face at Julian’s feet that, “Magi melted into the rock face like Padmasambhava. I did not know if she was there or not”. The brolga that witnessed the placement flew off taking Story into the Skies. 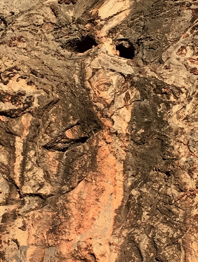 As fellow pilgrim, Astrea shared, “Once we had placed the Vase and were walking away with everyone playing the bells, the didgeridoo and chanting to Tara, I saw that that rock face had been awakened. The whole place became alive full of beings never seen before. The land was awake, listening, it had heard us. The guardians of the Rock Face were standing up alive”. It was done. On returning to camp, Astrea was lying upon her metal bed beside the fire, and looking towards the escarpment where the Vase had been buried and quietly chanting to Tara, there appeared in the sky directly above the placement site a very bright, luminescent green shield hovering over the cave. Later that evening there were many moving, flashing lights in the night sky. Aunty Shirley said, “These are spirit lights and they were all over the camp last night too.” She went on to tell us, “There are old ones, undomesticated ones, that live in that ridge (immediately beside the camp). They communicate with light – a bit like light shining in a mirror but they don’t have mirrors”. Just before dawn the last morning, a dingo moved across the land from west to east giving fourteen howls. With the last howl it stopped and pointed to the Pleiades/Seven Sisters star cluster that was rising in the morning sky just below Venus and the crescent moon. This is a rare occurrence and lasted for only a short time before becoming obscured as the daylight broke. At the same time the brolgas made a loud noise and flew off into the far paddock. The Seven Sisters Dreaming is known to many world cultures, ancient and present and Star Dreaming is central to the Purnululu/Gitja mob. The Seven Sisters are known as the Clan Mothers and thought by many to be the origins of life. Only six of the Seven Sisters stars are visible in the heavenly sky. The world is awaiting the return of the “Lost Sister”. Movingly, Aunty Bessie and Aunty Shirley shared at one point that they thought “nobody cared about us” but in our final sharing they expressed their joy and knowing that we “had brought the spirit” and that the “the dingoes and the brolgas flying off were saying goodbye and that Country was happy.” Aunty Shirley and Aunty Bessie also said that they would return each fortnight to protect and care for the Vase. I feel that this Vase was held by the Many and by a World presence that surrounded its placement. 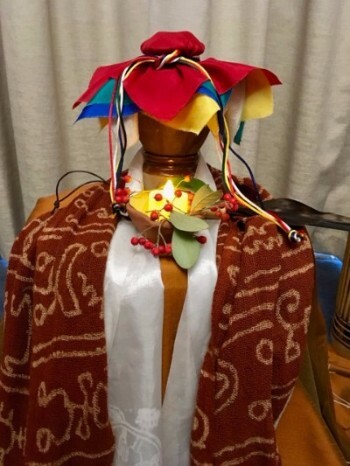 During the placing of the Vase in the cave, as the group was chanting, Julian experienced the coming in and encircling him, overwhelming numbers of indigenous elders and spirit people both known and unknown to him. 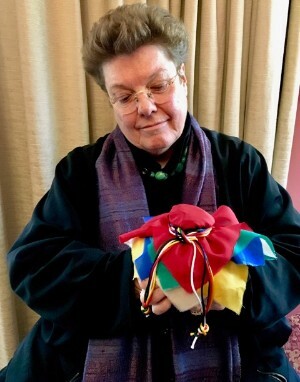 And finally, in pilgrim Zenta’s words, “We were in such a quickening, a ‘streaming of enactment’ – as if we had been swept up by a force so much greater than the sum of our parts. This Vase came with a destiny that only the pure light of Creation could meet – and meet they did. She lives now for ten-thousand years singing, sounding this great light of Love, into the Timeless Realms”. So thank you beloveds, for your presence as part of this world community and may all these endeavors serve, strengthen and Bring into Being the Great Dreaming of these many Vases. on behalf of the Kimberley mob and with particular thanks to our indigenous family: Jawoyn mob: Aunty Margaret Katherine, her husband David, her son Andrea and daughter in-law Rose and their daughter Charliesha, to Miliwanga Wurrben and the two Jawoyn boys Junior and Kangaroo Jack and the Gitja/Purnululu mob: Aunty Bessie Daylight, Aunty Shirley Drill and her granddaughter Claire and great grandson Grandpa (Brendan). This entry was posted on Wednesday, June 21st, 2017 at 2:55 pm	and is filed under Burials. You can follow any responses to this entry through the RSS 2.0 feed.